KWS UK launched three new ultra-early maize varieties at UK Dairy Day all of which push yields higher in this growing market segment. 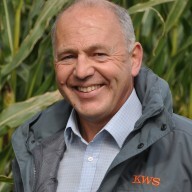 According to KWS UK maize manager, Rob Hunt, around seven in every ten fields are now down to ultra-early varieties. “While undoubtedly driving the crop forward in marginal areas, farmers recognise that they not only improve harvest timings but also enable faster turn round and benefits for the following crop.“Today’s varieties ensure there is little yield penalty and we’ve also been breeding and selecting for varieties that don’t compromise quality in the clamp as well. Sergio KWS – like Augustus – is FAO 160 rated and is a newcomer on the 2014 Descriptive List for first choice early varieties for favourable and less favourable sites. “It’s a higher yielding Kentaurus with a dry matter yield of 16.2t/ha compared to 15.6t/ha and combines this with a higher ME and starch yield than its sister variety.“The key stand out characteristics for Sergio KWS are its strong ME content at 11.3% and vigour. Indeed, its 8.1 early vigour score under less favourable conditions is the highest on the DL.“Sergio KWS offers above average yields for its maturity, from a similar plant type to Kaspian but with around with 10% more DM yield,” says Rob. “It is an ideal shorter season hybrid for use as a forage variety or for corn cob mix (CCM). The third variety, Aurelius is slightly later in the ultra-early bracket with an FAO rating of 180. “It offers unsurpassed DM in its sector and is a step up on Severus,” says Mr Hunt.“Across our work and in early stage NL trials, it is offering DM’s across all sites which vary from 110-115% of controls.“In 2013 it was around 5% higher yielding than Severus in our screening programme and in the same trials had an excellent starch of between 29.1- 38.1% and an ME content ranging from 10.7-11.7MJ/kg.”Aurelius also has rapid early vigour – from 7.7 in poorer conditions up to 9.0 on warmer sites. Like the others it is a stay-green type for a wider harvest window.